Despite his name, the Giant Schnauzer is not a giant breed, but simply a larger and more powerful version of the Standard Schnauzer. An active and spirited dog, his sound, reliable temperament, rugged build, and dense weather-resistant wiry coat make him one of the most useful, powerful, and enduring working breeds. His coat, including the beard and eyebrows that are the Schnauzer hallmark, is solid black or salt and pepper. The Giant Schnauzer developed in the Wurttenberg and Bavaria sections of Germany, which were both agricultural areas where dogs were in high demand as farm help. He aided the shepherd in driving livestock to market and was used as a guard dog by the butchers and breweries. During World War I the breed was recognized in Germany for its intelligence and trainability, becoming one of the breeds used for police training. 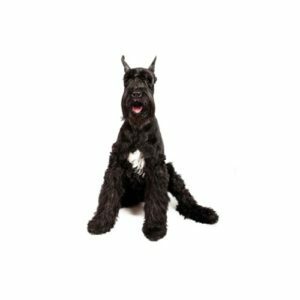 An extremely intelligent, energetic, strongly territorial dog, the Giant Schnauzer loves his owners and feels great responsibility to protect them. He learns quickly, however, and can distinguish between friend and foe. Giants need a lot of exercise, requiring daily walks, playtime with another dog or romps in the yard. They especially love having a job to do. The breed also requires regular grooming, including brushing and stripping, so owners should be prepared to spend time maintaining the breed’s coat. Ranging in size from 23_ to 27 _ inches tall at the shoulder. Are you interested in purchasing a Giant Schnauzer?